3 Alexandra House is a newly refurbished, large and spacious 3 bedroomed first floor apartment in the heart of Beadnell Village. It has been finished to a high standard and is a great place from which to explore the coast and countryside of Northumberland. 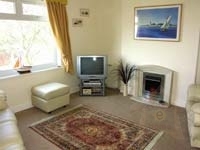 Large lounge with feature fireplace, leather suite, TV/Video/DVD player, freeview, mini hifi and views of the Cheviots. Kitchen /Dining room - the kitchen is fully fitted with a good range of equipment, it has beech units, built under oven with ceramic hob and steel cooker hood. It also has a fridge/freezer, dishwasher and washing machine. There is a large oak table with six chairs and from the window, you can just see the sea! The family bathroom is a good size, it has a shower over the bath is decorated in a costal theme. Bedroom 1 is a double room with built in wardrobe space, solid oak bed, and a TV/DVD combi. This room also benefits from a newly fitted en-suite shower room. Bedroom 2 is a large room which can sleep up to 4, it has 2 single beds and a bed settee which converts to give an additional double bed. It is fitted with quality waxed pine furniture, and has a TV. The property also has has night storage heating. 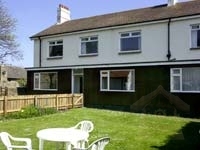 There is a large garden at the front of the apartment which is gated and has garden furniture. At the rear is a private parking area and a garage (which has a barbeque for guests to use, and a variety of fishing nets etc.) There are also bikes for guests 1 adult, 1 teen and 3 smaller ones. A baby gate is available on request. We are sorry but Alexandra House is no smoking and there are no pets allowed.